This is a project for fans far away to enjoy concerts remotely. This project merges my passion and everything I learned from my work in stage design and experience in the interaction design program at California College of the Arts. Seeing your favorite artist in person is one of the best feelings in the world. While I was working as a stage designer, I realized the importance of the audience. I wanted to design a meaningful experience - not only for the live audience but also for the virtual audience. Everyone can enjoy concerts everywhere. There were 15000 live audience members in the physical arena. And there were 8 million viewers online, which is 500 times more than in the arena. Here are some moments from other concerts that inspired me. Beyonce grabbed a fan's phone during the concert to FaceTime with fans faraway. Recently, we can see these kinds of moments more often. So, I began to ask myself. "Who are our audiences?" 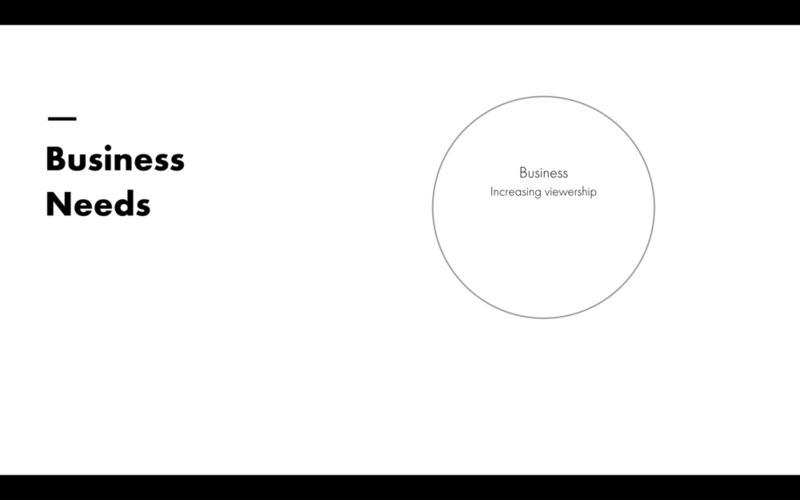 First, a business goal is increasing viewership - so that the company can make money. The artists' goal is meeting fans as much as possible - so that they can share their album and it benefits them. The fans' goal is also meeting the artists as much as possible - it excites them and directly affects their happiness. I tried to understand who is important and what their needs are. Nowadays, the online audience is critical in the entertainment & media ecosystem. Companies know this and offer live streaming platforms such as Youtube, Facebook Live, IGTV, but this form of communication is only one way - so online audience engagement is low & short. To understand the online audience's needs and curate the best environment for them, I did secondary research regarding the relationship between screen size and engagement. I also did secondary research on the pros and cons of live interaction, as well as competitive research about existing VR live events apps and live streaming mobile apps. For primary research, I did an in-depth case study and survey. I was lucky to have a chance to observe one fan's room. Also, she opened her K-pop community to me, so I could get valuable insights via quantitative research. From this research, I got an insight that engagement and feedback are correlated. Ailin said, the most exciting thing to fans is the opportunity not just see the artist, but to be seen by the artists. Fans really want to interact with artists in some way - and it gave me an idea on how to transfer this desire into the VR environment. Insight 1. There’s high desire to attend concerts. Insight 2. Engagement and Feedback are correlated. Insight 3. Future ticket sales on live streaming is increasing. I found three VR applications that are similar to my proposal. However, all applications lack a communication system between artists and audiences. Also, there's no post concert experience which is a big part of the experience. 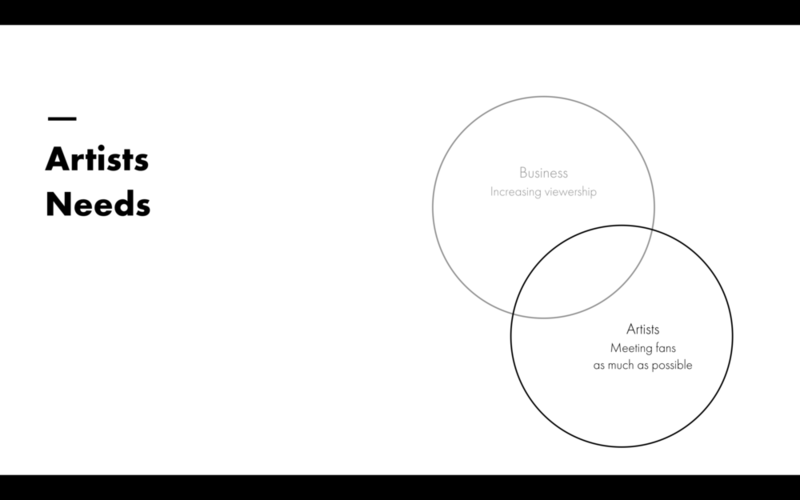 Based on competitive research & analysis, I am envisioning the platform emphasizing the interaction between artists and audiences. Ailin receives a message from her friend. Her friend is recommending a vrcon app to her. Ailin explores the app and buys a ticket. After buying a ticket, Ailin can submit a question to the artists. She can pick her avatar and record her question. This is optional for fans. The reason why I came up with the avatar is, in my previous work we tried to implement a real human video chat with fans during the concert, but there was bullying. So I want to give fans freedom and safety with the avatar. On the day of concert, Ailin gets a notification from vrcon and also her friend said she will join. At home, she enters VR and meets her friend. They enjoy the concert together. This is the system that I am envisioning. This is a stage that I designed before. In stage design, for safety reasons, an empty space surrounding the stage floor if required. We call it the “dead zone”. But now, I see this space as an opportunity for the VR space. Recently, many 360 cameras are installed for VR experiences like this. The orange boxes are where the virtual audience can sit. It can be expandable. They can teleport wherever they want. This is for a key moment in the concert. For a designated time, artists pick a number and reply to a VR fan’s question via big screen in the stadium. Back to the VR, Ailin can enjoy the concert from the first row and see her favorite artist up close. When she turns around, she can see the live audience and also feel the vibe of the concert. This is the key moment. Artists pick numbers, and 4-5 questions are answered. In this scenario, Ailin’s question was selected, and the artists reply to it. 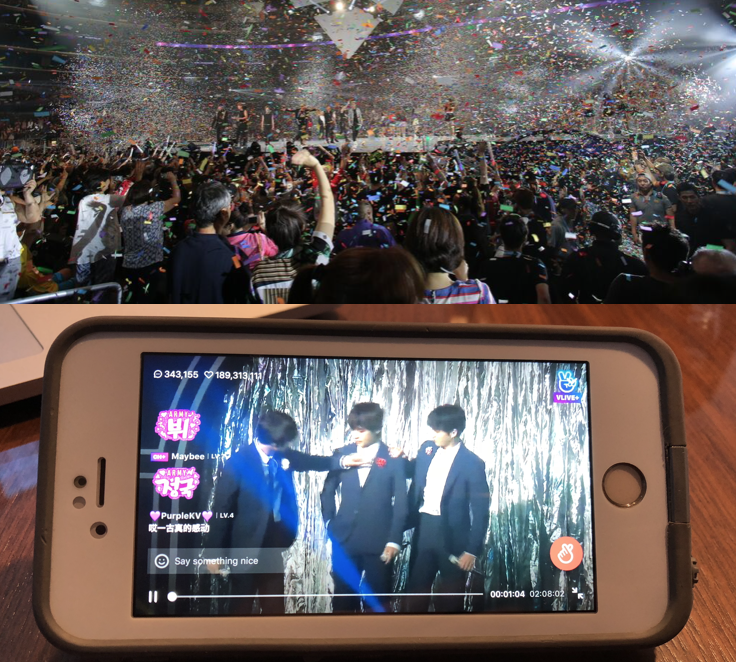 After the concert, Ailin re-watches the key moment and posts it on her instagram and shares it with her friends. Virtual concerts can't replace the live show experience, but it can provide a unique experience that can't be replaced in the real world. The fans' number one priority is participating in a concert in person which is not always easy due to location and money. For now, VR has a role in terms of accessibility. But I believe it can go one step further by enhancing the communication system through VR. By validating my proposal with 12+ fans, I realized that virtual experience gets synergy when it comes with other mediums such as VR and mobile. Bridging the VR concert experience with pre-concert / post-concert experience truly maximizes fans' excitement. I can't stop thinking about the VR concert experience. This is an ongoing project. If you have more questions about my experience, please feel free to contact me. Let's talk!